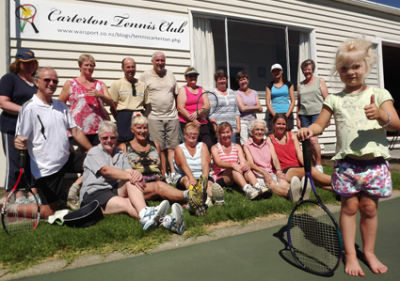 The Carterton Tennis Club welcomes new members. We have four top quality plexi-pave courts and floodlights, an old, but welcoming club house and friendly members. We cater for all levels of play, including children. You can become a full member and take part in club activities. Alternatively, you can join club activities as a casual, or buy our $25 a year, Play Anytime membership which gives you use of the courts when the club is not in session. See our website: www.cartertontennis.co.nz for information and contacts, and our Carterton Tennis Club Facebook Page. Find us between Carterton School, Holloway Road, and Carrington Park.